Mac and cheese – comfort food at it’s finest and with this recipe at it’s fastest! 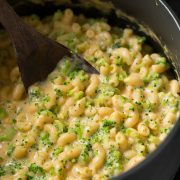 I love how simple this recipe is. How could something so easy yield such rich, flavorful results? Who could ever make a box mix again after making it homemade? When creating this recipe I added a few unusual ingredients because I love adding just a bit more excitement to food. 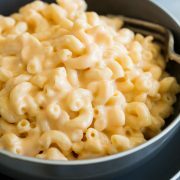 The liquid smoke flavor, Dijon mustard, onion powder and garlic powder blend in so well you hardly know they are there. They just enhance the dish, not overpower it. 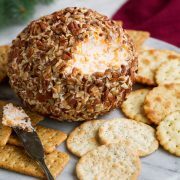 I love the combination of Cheddar and Monterrey Jack cheese, they are my two favorite cheeses so of course they had to be the two cheeses I used to make this recipe. 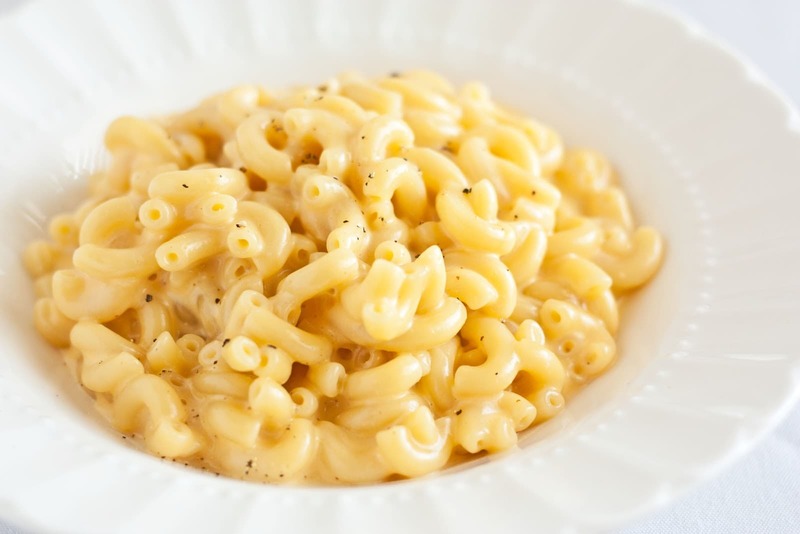 They both melt so smoothly to create a perfectly silky, decadent macaroni and cheese. Enjoy! Rich and creamy super easy to make, deliciously cheesy mac and cheese! Cook pasta according to directions listed on package until cooked through (just past al dente), and drain. 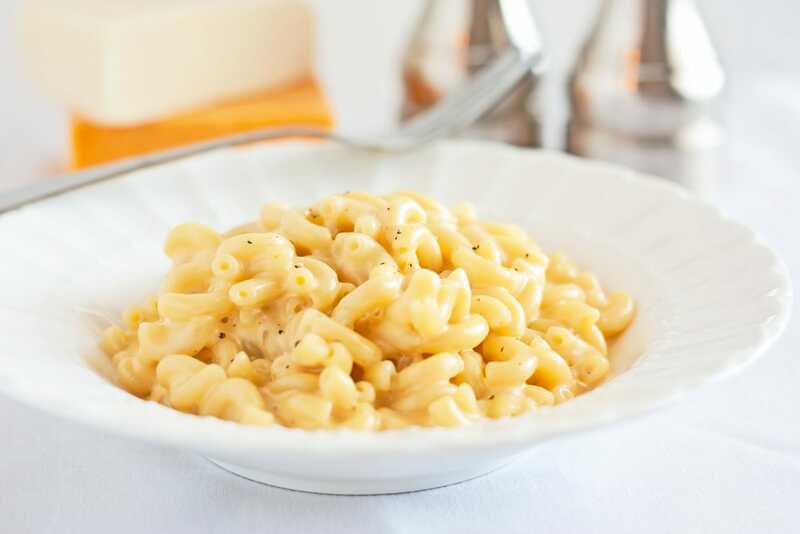 Meanwhile (in order to make this a 15 minute recipe I made the sauce as the noodles were cooking), in a medium saucepan combine 1% milk, butter, onion powder, garlic powder, liquid smoke, Dijon mustard and salt then scald mixture over medium heat. In a mixing bowl, whisk together egg yolks with 1/2 cup evaporated milk. Add 1/4 cup scalded milk mixture to egg yolk mixture and whisk, then pour and whisk mixture into saucepan. Cook mixture over medium low heat, stirring constantly, until mixture coats the back of a wooden spoon, about 3 minutes. 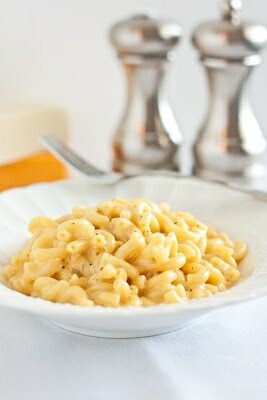 Add cheese and drained pasta to sauce mixture and gently toss mixture with a rubber spatula until cheese has melted. Serve immediately sprinkled with optional black pepper or cayenne pepper.